In this section we highlight a number of electrical devices out there that can help make your skin look great again if it is suffering from the signs of ageing, acne, skin issues such as thread veins or is just in need of a deep clean. 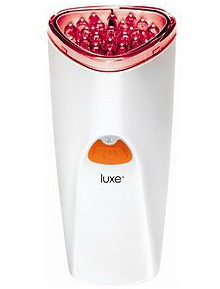 Red-Light (also known as “photo-facial”) treatment uses a specific wavelength of red light (around 660nm) to trigger fibroblast cells in our bodies to increase the natural production of collagen and elastin (which makes your skin firmer and more flexible again) and increase micro-circulation (which gives your skin a fresher and more youthful appearance). It also has been shown to increase the rate of skin cell growth from 150 – 200%, helping the skin to regenerate and heal itself quicker. So, if your skin is showing the signs of ageing or you suffer from skin conditions such as light acne scaring, broken capillaries, cold sores or pigmented lesions then this is a safe, pain-free, non-invasive and effective alternative. Blue light based acne treatment systems work by gently penetrating the skin with a specific type of light that targets and kills the bacteria that feeds on blocked pores – the main source of most acne and inflamation. With home treatment systems you can get the same level of effectiveness as professional / prescription treatments but, even if used daily, will not cause dryness, redness or other irritations.